The reserve is also interesting at other times of the year. 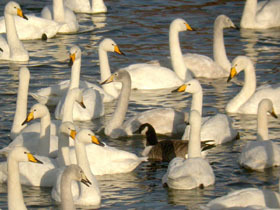 Spring brings wading birds to the reserve either on passage to the north or to breed. These include Avocets, Lapwing, Snipe and Little Ringed Plover to breed and Black Tailed Godwit and Ruff on passage. The reserve is also very good for Corn Bunting a rare bird in Norfolk. Summer can be quiet for birds but excellent for butterflies, dragonflies and damselflies. During Autumn the reserve sees a passage of wading birds returning from the arctic to their warmer wintering grounds, a range of birds stop to feed on the Washes including Ruff, Black Tailed Godwit, Greenshank, Curlew Sandpiper and Little Stint.